Since we’re living in Germany, we started looking for breeders in the area. When we started the whole puppy search process we were actually still looking at three dogs: Golden Retrievers, Lab Retrievers and Newfs. After talking with some people at our local pet store, we decided that a Lab was probably more work than we were prepared to take on as this is my husband’s first dog and the first one in a long time that I’ve had to train from puppyhood. We weren’t looking for a dog that will take tons of time away from us every day which we constantly need to entertain. Sure, with a puppy you have to be there all the time, watching, waiting and anticipating every move. But if it would need to be so later on in life as well and we’d need to spend hours entertaining and excercising an adult dog, we knew we just wouldn’t have the time or energy. In mid-March 2006 we decided to take the plunge and go look at some puppies. 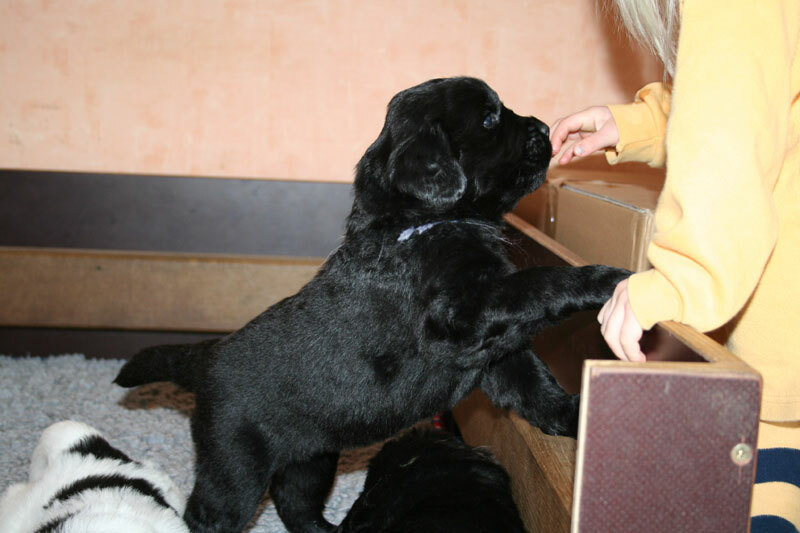 We made appointments to visit a Newf breeder and a Golden Retriever breeder. Naturally we fell in love so many times that day that we had some trouble making a decision. The Newf puppies were so adorable and, at only 3 weeks old (born Feb 23, 2006), still quite small, even in comparison to the Golden puppies. But it became pretty clear to us when we were visiting the Goldens that they were going to need lots and lots of love and attention at all hours of the day and throughout their lifetime. We met the mother, grandmother and aunt of the Goldens and all three of these grown dogs fought more for our attention than the puppies. We knew then that although they were precious, we just weren’t prepared to give that sort of time and devotion to a pet. With two cats to worry about already, we knew it would just be an overwhelming experience and not at all what we wanted to get into. Leaning heavily in the direction of the Newfs, we decided to follow the advice we’d read on the internet about carefully choosing a puppy and were able to get in touch with the owner of the Newf doggy daddy which is located relatively close to us as well. Since the owner had some time for us, we went out to visit Gironimo Cayuga vom Bärensee. He is absolutely handsome and the owner and his family have been breeding Newfs for over 30 years. He gave us some advice to select a female since this is basically our first time around and that we would likely have some attitude challenges with a male that we might have trouble controlling. This visit also gave us the chance to visit a few other Newfs as Gironimo lives with about 5 other Newfs ranging in ages from 6 months to 10 years. After speaking with him and the dogs, we knew our hearts were definitely sold on a Newfie. The breeders of the puppies had already decided that they would be keeping the black and white female for themselves…and I certainly couldnt blame them cause she is just a doll. But that left us with the dilemma of boy vs. girl and was the risk of not being able to control the dog worth it just so we could have a black and white one? Ultimately, we did the reasonable thing and got the black girl. She is the smallest of the litter but also the most active which seems to explain her lighter weight since she’s always running around like a wild beast. Taking the breeder’s advice to heart, we were torn about taking the one black girl Newf available or going the hard way and trying to take a black and white boy just because they are so adorable. In the end, we did decide to go with a girl and, as this is the first litter of puppies this breeder has had, we had to pick an “A” name, at least for her papers. This was actually quite an interesting process which included us searching tons of baby and dog name databases to find a name which we liked enough to possibly use for her “regular” name as well. We eventually settled on Ayla (Hebrew meaning “oak tree”) which we’re thinking will be a really good fit.